Yesterday my friend Deb and I exchanged gifts. It was so good to be able to sit down, and chat. She bought me this loom that I have been wanting. It is used to make rag rugs on. Its made locally and will be perfect for all the clothes I have cut up. My first project was to use up the bailing twine that I have in the barn. Most bailing twine is treated against rot and rodents and I have looked online and I can get some that has not been treated. I am wearing gloves as I don’t know if this is treated or not. I have knitted bailing twine rugs before and woven them on the loom . This may work out well or not. These rugs are good to put in front of a door as the coarseness of it will get most of the dirt off of your shoes. It took no time to warp and its slower to weave, especially the first row. If you had bailing twine without the knots it would be a lot easier, and thinking now I would have cut out all the knots on the weft. I am doing a twining weave . 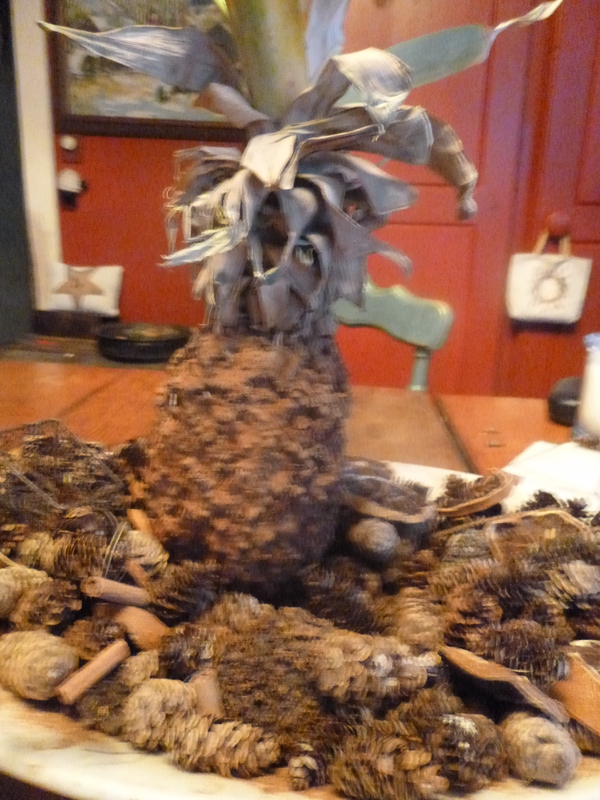 I wanted to show you the pineapple and how it has dried. All the while drying it filled the air with sweet scent of pineapple and cloves and cinnamon and its as light as a feather. You could make these early in the season and attach them to a wreath or string 3 or 4 of them over a door with greens. My Mother used to grow them in Florida and I was successful in growing them here in New England. They were started late spring and brought in before it got chilly at night, end of September.